Born in Qameshli (Syria) in 1951. Studied at the Faculty of Arts, Damascus, 1976. Studied at the École Nationale Supérieure des Beaux-Arts, Paris, 1986. PhD in Arts, Université Paris VIII, 1989. He lived and worked in Paris as from 1981 until his return to Damascus in 2005. After 25 years of com­pelled exile and of being for­bidden to go back to Syria, it was finally pos­sible for him to go to Damascus in 2005 and to organise a large exhi­bi­tion there. Since 2010, his Syrian pass­port was con­fis­cated and he could nei­ther exit the country nor return to France where his wife and daughter live. The works of Youssef Abdelke are in a large number of museums and insti­tu­tions, including The British Museum, the Museum of Kuwait, the Shoman Foundattion and the Institut du Monde Arabe. Artist Youssef Abdelké’s highly acclaimed work is renowned for its sin­ister under­tones and unique sym­bolism which expose the bru­tal­i­ties of life. 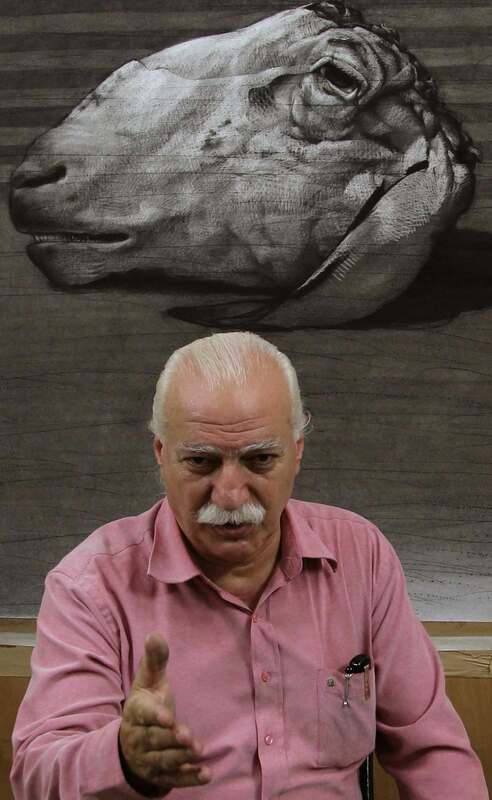 Based in Paris, the 57-year-old Syrian painter breaks with tra­di­tion through his unique approach to still life drawing. His intriguing works have turned heads the world over, selling in such inter­na­tional auc­tion houses as Christie’s and Sotheby’s. In addi­tion, his long-awaited exhi­bi­tion in Damascus in December 2007 gen­er­ated huge interest among art lovers. According to Manaem, true artistic talent does not reveal itself in the way a fish is drawn or the manner in which its details are cap­tured, but in its power to make the fish an expres­sion or a symbol of life. “A fish embodies free move­ment and the vast sea. In the fish, there is both coher­ence with place and the impos­si­bility of living out­side it,” writes Manaem. “In its eter­nally wide-open eyes, there is a bla­tant chal­lenge and con­dem­na­tion of death.” When the fish is depicted sliced open or pierced by nails, the bru­tality of this image con­veys an under­lying mes­sage about the world. However, Abdelké’s harsh style and severity of sub­jects remained, even in his still life draw­ings in the form of skulls, bones and sharp knives. “Artists can’t change their skin even if they change their sub­ject matter,” Abdelké explained. Abdelké’s con­cept of space has how­ever changed. “I’ve been inspired by the phi­los­ophy of people in South East Asia. They see man as a small part of the uni­verse; space in their paint­ings reflects the huge space we have in our uni­verse. Europeans on the other hand, see man as the centre of the world, that’s why you find their paint­ings full of people and ele­ments,” Abdelké said.